“Curious Minds” is an eclectic series of talks, by leading experts in their fields, exploring the theme of Contemporary Science in Scotland. But don’t expect Powerpoint slides stuffed with meaningless formulas and jargon. We have asked our experts to come along and explain their work in terms we can all understand. Quite a challenge! We have a great set of talks lined up this year. Interesting, varied, relevant and many of them quite thought-provoking. The season starts on 12 October with a lecture by Dr Alison Sheridan of the National Museum of Scotland. It is appropriate to start off with a talk on archaeology, as 2018 marks the 70th anniversary of the Archaeological and Historical Section in PSNS. Alison will describe how jade axe heads made their way from a remote source in the Alps to the farthest fringes of Neolithic Europe –including Perthshire. Here is some background information on Alison. How do you find evidence for a planet orbiting a star that is tens or even hundreds of light years away? And how can you learn anything about it? Frank Gunn-Moore is a Molecular Neurobiologist who works on proteins that are involved in the development of mammalian nervous systems –and how they are affected in diseases such as Alzheimers and Cancer. Cat spends most of her time in the field, in Uganda, working with Chimps and Mountain Gorillas. Her main area of research is communication. You may have heard her recently on BBC Radio 4 “The Life Scientific”. 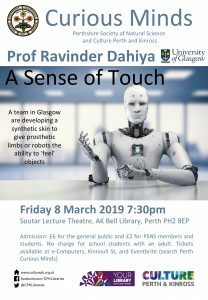 Ravinder’s team works on developing pressure sensitive membrane materials that can be used to create synthetic skin for robots or prosthetic limbs –where the limb can emulate a sense of touch. You can find our more here. We are all very aware of the risk of fires in high buildings. 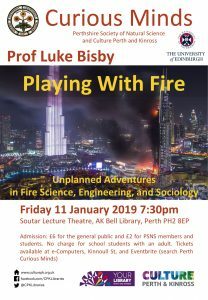 Luke Bisby is Arup Professor of Fire and Structures. He is intimately involved in studying fire incidents and in formulating policies on fire safety. He was the author of an expert report on the Grenfell Tower fire. You can learn more about Luke here. 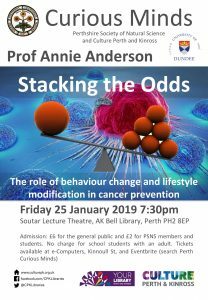 Annie co-directs the Scottish Cancer Prevention Network. It is not possible to eliminate the risk of developing cancer but healthy lifestyle choices can significantly reduce that risk. This talk has been cancelled. The Photographic Section are arranging an alternative event. Please watch this space for details. We increasingly rely on technology to help us organize our lives and communicate with the World. Mobile phones. Google. SatNav. To some extent, our devices have taken over many of our thought processes. Losing your phone can be equivalent to losing some of your memories. Mike will discuss some of the implications of this and touch on how AI will continue to change our world. We all enjoy spending time in our native Caledonian Pine forests. But recent work by Richard’s team has shown they are under threat from diseases and fungi carried by ‘exotic’ species of trees. 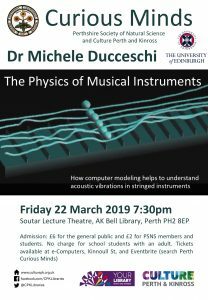 Michele has developed a model of non-linear string vibrations for sound synthesis. He specialises in Double Bass and Guitar. He will talk about his work –followed by a demonstration by two local musicians who are PSNS members. We need energy –but not all sources are either desirable or practical. Fracking has been proposed but John’s work has shown that Scotland’s underlying Geology makes it a less than optimal choice. The talks take place on Friday Evenings, at 7:30pm, in the Soutar Theatre of the AK Bell Library. Admission is £6 for the general public and £2 for PSNS members and registered students. School pupils are free. 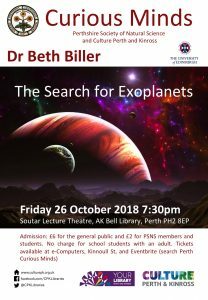 Tickets will be available at e-Computers on Kinnoull St in Perth and at www.EventBrite.co.uk (Search for PSNS Curious Minds). ◾’Georgia: a country at the crossroads of history, geography and culture’, by Tom Ryan. Admission free; all are welcome, although only PSNS members can vote at the AGM.